From playing on laptops and iPads to watching a lot of television, children seem to be spending more and more time indoors being inactive. This increase in the number of children spending more time indoors has lead to a lot of studies. What these studies are discovering is the negative impact staying inside has on kids. It isn’t pretty. Staying inside and not getting outside enough has a negative impact on health and development. Kids are naturally drawn to the outdoors and playing outside has a number of benefits. 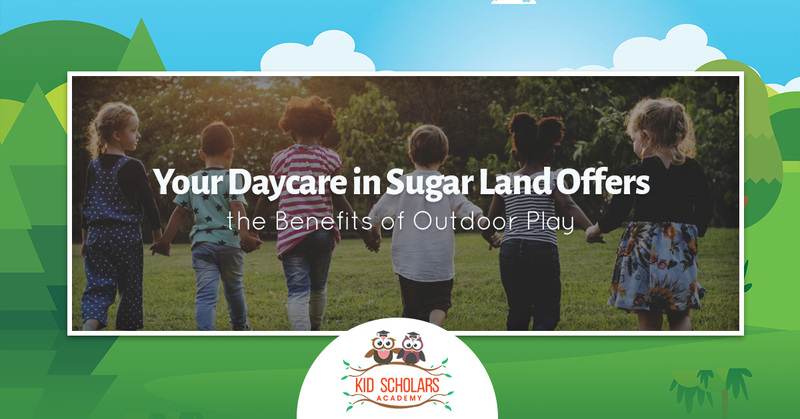 Kid Scholars Academy, your daycare in Sugar Land, offers the benefits of outdoor play. Going down a slide is a lot scarier than watching a television show. Outdoor play often involves activities that are a little riskier than indoor activities. And while your child might be afraid to go down the slide right now, in time they will overcome this fear and go down it again and again. Outdoor activities and play equipment help children to learn to push their boundaries by teaching risk assessment. Outdoor play also helps your child explore new games and new adventures and become confident in doing new things without being guided by an adult. It is much easier to direct and supervise a child in an enclosed space. When children are outside, they have a much larger space in which to play and interact. Often, their play is away from direct adult supervision and this helps encourage independence. A child will play by themselves, negotiate unfamiliar terrain or equipment and they will pick themselves up from the ground should they fall. Children who have the freedom to play outdoors are happier and calmer. Studies have shown outdoor play leads to improved moods and creates a positive mental attitude. Outdoor play also encourages children to get rid of all of that energy they build-up when inside. Which is why recess at elementary school helps kids stay better focused. Generally speaking, outdoor spaces are less crowded than indoor social settings. So children who are shy might find it easier to come out of their shells and be a little more social. Being outdoors might also encourage children to talk with others and make new friends. Children who play outside tend to build strong bones and have better fitness levels than children who don’t play outside. In addition to burning off extra calories and extra energy, playing outside ensures a hefty dose of vitamin D.
Away from the constraints and confinement of indoor play, outdoor play is a great way to encourage a child’s creativity. When a child is outside, their imaginations are stimulated by the objects around them. By putting educational equipment outdoors, you encourage children to learn new information and skills. Outdoor activities that teach children also make children think of learning that happens everywhere and all of the time as opposed to just during the day and in a classroom. Our mission at Kid Scholars Academy is simple, we want your child to excel in every possible way. Give us a call today.